ATA Executive Director Edward Bergman issues a statement on US President Barack Obama’s trip to Ghana. The positive impact this trip could have on the tourism industry in Africa is highlighted. Tourism’s role in furthering the development of the African continent is also examined as a result of President Barack Obama’s trip to Ghana. This is the second issue of ATA Congress News & Views, the e-newsletter of ATA’s 34th Annual Congress, which opened two days ago at the Conrad Hilton Hotel in Cairo, Egypt. Today, we bring you some news from our Congress, as well as some pictures from some of our workshops. The Africa Travel Association (ATA), in cooperation with the Egyptian Ministry of Tourism and the Egypt Tourist Authority, opened its 34th Annual Congress in Cairo two days ago. Under the banner of “Connecting Destination Africa,” the world event brings together current tourism ministers from Africa and the region’s leading figures from the travel industry to promote travel, tourism and transport to Africa and to strengthen intra-Africa relationships to make this happen. Held at the Conrad Cairo Hotel, the ATA Congress was hosted by the Honorable Zoheir Garranah, Egyptian Minister of Tourism and Amr El-Ezaby, Chairman, Egyptian Tourist Authority (ETA). Click here for the press release. Dr. Elham M. A. Ibrahim, Commissioner of Infrastructure and Energy of the African Union, sent a letter to the ATA congress delegates, which was read during the opening ceremony. Click here to read the letter. ATA introduced a marketplace for buyers and spellers specializing in Africa at the Congress on Tuesday, May 19. Titled, “African Bazaar,” the marketplace provided a forum for more than 25 sellers and 80 buyers to hold one-on-one appointments. On Wednesday, ATA’s Young Professionals Network met with 80 Egyptian students at the American School, Dar El Tarbiah School in Cairo, where they asked each other questions that helped combat negative stereotypes such as how they perceive the "other." The YPN forum was coordinated by Dr. Cathy De Leo and NYU student Levald Thomas. Kalimah Abioto, one of the US participants, filmed the student exchange, which will be available on her website, www.thepeoplefly.com. ATA also premiered the new film I Bring What I Love: Youssou N’dour, a music-infused documentary about how one man’s voice could inspire change in Senegal and across Africa. The film chronicles N’dour, a devout Sufi Muslim, as he releases a deeply personal and religious album called Egypt in hope of promoting a more tolerant face of Islam. Jack Turner, the Executive Producer, introduced the film to a captivated audience of Africa enthusiasts. Click here for more on the documentary. Honorable Shamsa Mwangunga (MP), ATA President and Tanzania’s Minister for Natural Resources and Tourism, opened the ATA event on Monday, May 18, and introduced Amr El-Ezaby, Chairman of the Egypt Tourist Authority, who said the ATA Congress presented an extraordinary opportunity for people to share information and ideas on developing and marketing the tourism products of Africa. Edward Bergman, ATA Executive Director, also spoke at the opening ceremony and shared the letter from Dr. Elham M. A. Ibrahim, Commissioner of Infrastructure and Energy of the African Union, with the congress delegates. In a session chaired by Amr El-Ezaby, Chairman of the Egypt Tourist Authority, travel operators, Amr Badr, Head of Abercrombie & Kent, and Karim El-Minabawy, Vice Chairman of Emco Travel, discussed setbacks Egypt’s tourism has faced over the years, and how these challenges were met and overcome. The first day of workshops wrapped up with a special presentation on the FIFA 2010 World Cup. Sindiswa Nhlumayo, South Africa’s Deputy Director-General, Department of Environmental Affairs and Tourism, shared South Africa’s perspective on the premier sporting event. Ray Whelan, the leading representative of MATCH, the service company appointed by FIFA to handle hospitality and ticketing for the FIFA World Cups in 2010 and 2014, spoke about how the mega sporting event, the largest to date on the continent, can benefit all of Africa. Rui Lisboa, a representative of the Angolan Ministry of Affairs spoke about the upcoming Africa Cup of Nations and a representative from Cameroon spoke about the importance of soccer to the nation. Honorable Mohamed Zoheir Garranah, Egypt’s Minister of Tourism and the host of the ATA congress, invited delegates to the Salah el-Din Citadel for a festive evening, including whirling dervish dancers, a musical performance and Egyptian cuisine. Against the backdrop of Cairo, the evening at the Citadel provided delegates with a once-in-a-lifetime opportunity to enjoy Egypt at its finest. The second day began with a discussion on hotels in Africa. Moderated by Matewos Gebremariam, Ethiopia’s Head of Standardization & Facilitation Department, Ministry of Culture and Tourism, the discussion focused on formats that work in Africa, as well as trends. The high level panelists included Omar Carrera, Executive Assistant Manager, Sheraton Addis, Starwood Hotels & Resorts, Addis Ababa, Ethiopia, Glenn Carroll, Senior Vice President, Sales and Marketing, CHI Hotels and Resorts, Malta and Amr Kallini, General Manager, Movenpick Hotel, Media City. The next workshop, which was chaired by Tanzania’s Honorable Halima Mamuya (MP), focused on advocating for “Destination Africa.” Dr. Yaw Nyarko, Director of the Africa House at New York University, asked the panelists to speak about the need to create a collaborative working document that states why the tourism industry is important for Africa with the support of statistical analysis. Besa Muwele, Principal Statistician at Central Statistical Office of the African Development Bank spoke about the Bank’s efforts in this direction. Sarah Graham Mann, an Adjunct Professor at New York University spoke about the American market and suggested the ways African tour operators can attract the US marketplace. Karen Hoffman, ATA Board Member and Senior Vice President of the Bradford Group led a discussion on how ATA members can use social networking tools, such as Facebook, YouTube, Twitter, and Blogging in attracting new audiences. The presenters included Emily Bayley, ATA Member Services and Development and New York University student, Llyod Murray, President, Palace Travel Inc., Philadelphia, Omar Carrera, Executive Assistant Manager, Sheraton Addis, Starwood Hotels & Resorts, Addis Ababa, Ethiopia, and Gregg Truman, ATA Board Member and Vice President of Marketing, South African Airways. The day wrapped up with a workshop on tourism industry trends. Peter J. Mwenguo, Managing Director, Tanzania Tourist Board moderated the panel of leading experts who provided a bird’s-eye view of the current and future marketplace. Presenters included Dr. Gaynelle Henderson-Bailey, ATA Board Member and President of Henderson Associates/Henderson Travel Service, spoke about the upcoming African Diaspora Heritage Trail Conference in Dar es Salaam Tanzania in October, 2009. Jani Nayar, Executive Coordinator, Society for Accessible Travel & Hospitality, spoke about accommodating special needs travelers and tourism across Africa. Ogo Sow, ATA Board Member and Advisor on Diaspora Affairs spoke about the important role the Africa Diaspora can play in the tourism industry. Shahinaz Reza Ahmed, CEO, Education for Employment Foundation in Egypt spoke about efforts to promote employment opportunities in Egypt through collaboration, and Munzali Dantata, Director General of the National Institute for Hospitality and Tourism, Nigeria spoke about educational travel opportunities. At the end of the second day, congress delegates were invited by the large Tanzanian delegation to the Tanzanian President’s Dinner and 9th Annual Awards ceremony, one of the congress’s most popular events, which took place at the Four Seasons Hotel. As the host of the evening, Honorable Shamsa Mwangunga, Minister of Natural Resources and Tourism, presented awards to individuals and organizations who have helped promote Destination Tanzania over the last year. She also led the guests in an evening of Tanzanian food, dance and celebration. Click here for the press release. The third day of programming began on Wednesday, May 20, with a workshop on Africa’s travel products. Ambassador Daudi Mwakawago, ATA board member, moderated the session that explored Africa’s diverse travel products, from culture and heritage tourism to youth travel and from fashion to sea and sun. Presenters included Ethiopia’s Honorable Tadelech Dalecho, State Minister for the Ministry of Culture and Tourism, Patricia Brown, ATA Board Member and President of KTI Express Travel in Sierra Leone, Chief Margaret Bolanle Idowu Fabiyi, ATA Board Member and President of WEBISCO, International Federation of Women Entrepreneurs and Tourism, David Omboga, Kenya ATA Chapter president and Eliseo Neuman, Director of the Africa Institute. The final workshop focused on how to market “Destination Africa,” specifically what professionals need to know when doing business. Eran Ketter, a media strategist and researcher, spoke about the importance of marketing and branding in today’s cluttered environment; Lisa Simon, President and the National Tour Association (NTA) spoke about the increasing desire of North American tour operators to bring travelers and tourists to Africa and what professionals need to know when doing business in the marketplace. Dr. Adam Wu, Chief Operating Officer of China Business Network (CBN) gave insights on how to reach out to China’s marketplace. The congress ended with a full-day tour in Cairo sponsored by the Ministry of Tourism. Highlights included a visit to the Egyptian National Museum, the Giza Pyramids and the Khan El-Khalili market. Organized by the Egyptian Ministry of Tourism and the Egyptian Tourism Authority, the host country day will conclude with a cruise on the Nile and a gala dinner at the Nile Maxim Floating restaurant. In just 10 years, Egypt has gone from its original three standard-bearers to almost 20 world- class golf courses – with many more under construction or planned. The courses are spread right across the country. One can tee off in the historic heart of Cairo, and Cleopatra’s home city, Alexandria; play on courses which are part of huge, self-contained leisure complexes in Cairo’s suburbs; swing away on a pristine stretch of the Mediterranean coast; send a drive soaring towards the Luxor mountains where the pharaohs of ancient Egypt were buried; and sink putts on Red Sea Riviera courses from the Sinai Peninsula to the northern and western Red Sea coasts. It is golf of the very highest caliber. Famous names including Gary Player, Fred Couples and Karl Litten have already put their stamp on Egypt’s courses. New projects will bear the hallmarks of such luminaries as Nick Faldo, Greg Norman, Robert Trent Jones Jr, Jack Nicklaus and five-time Open Championship winner Peter Thompson. Egypt has played an important role in the history of Christianity’s Holy Family as well as in the roots of Judaism and Islam. Moses had deep ties to the country especially in the Sinai, and there are many Biblical sites that are of great significance to all of the three major monotheistic religions. Egypt’s population has been predominantly Muslim since the 12th to 13th centuries, though 10 % of the population is Coptic Christian. Although the ancient religion of the pharaohs, worshipping the God Ra or the conflict between Amon and Aton, will always be part of Egyptian mythology. Egypt’s historical ties with the Holy family are not widely known. When Christ was an infant, the Holy Family fled to Egypt in fear of persecution by King Herod. Their four year sojourn took them from Al-Farma in the north east of Sinai to Al-Muharraq Monastery in the southern Nile Valley. Egyptian authorities have undertaken a major project to re-pave the “Route of the Holy Family” and give prominence to the religious landmarks along this route. Visitors will also find it interesting to see many of the famous Mosques, Coptic Churches and Jewish Synagogues. The most famous, El-Azhar (970 A.D.), stands in the centre of Cairo, the city of a thousand minarets. Worth looking at while strolling around Cairo’s Muslim quarter, in the area of the medieval Khan el-Khalili market: the El Gouri complex, the el-Ashraf Barsbay Mosque, the Sayyidna el-Hussein Mosque, the al-Saleh Talai Mosque, the el-Aqmar Mosque, the Ibn Toulon Mosque, the Sultan Hassan Mosque; and the famous Mohamed Ali Mosque. Monasteries and places of worship: Old Cairo’s churches (St George’s church and convent, St Sergius’ and St Barbara’s churches, the “hanging” church), the Coptic Museum; In the Eastern desert, St Anthony’s, St Bishoi’s, St Katherine’s monasteries in Sinai, the Aswan Cathedral, Maadi and Gabal El-Teir churches etc., as well as many springs, wells, “sacred” trees such as Al Abed “the worshipper”, at Nazlet Ebeid-Minia. In Cairo: The Ben Ezra Synagogue in the Coptic quarter and the Sha’ar Hashhamayim Synagogue; In Alexandria, the Eliyahu Hanavi Synagogue. Desert tourism offers adventure and a glimpse into the nomadic Bedouin culture. It can be explored by trekking, hiking, 4×4 land rovers as well as by camel. To the west of the Nile, the Western Desert contains numerous lush oases. Scattered in a wide arc like islands in an ocean of sand, the oases are accessible from Cairo and Luxor. In both cases, a week is needed for exploring these desert wonders and, in particular, visiting the Dakhla Oasis where the inhabitants have preserved their traditional settlement. The White Desert with its astonishing limestone formations and the Black Desert with its black, pyramidal hills are another two stopover sites en route. The desert on the Sinai Peninsula adds a spiritual dimension to the rich array of landscapes in this region. At the summit of Mount Moses (Mount Sinai) or in the Colored Canyon close to Nuweiba, in the Ras Muhammed natural park, one can truly experience the total serenity of the desert. A safari to south Sinai is not complete without a visit to the biggest of the region’s oases, Wadi Feiran. Socrates himself was singing the praises of Egypt’s healing therapies and spas some thousands of years ago. While Aswan was renowned for its rheumatic remedies, ancient tourists swarmed to Safaga to cure certain skin diseases such as psoriasis. Whether visitors want to bathe in sand or salt-rich seas, soak in hot springs or wrap oneself in curative clay, Egypt has centuries of experience in catering to its therapy keen tourists. Aswan: Good for traditional Nubian therapies and environmental therapies including sand bathing and massages. New Valley: With an abundance of bubbling hot springs, the hot water wells of the New Valley are naturally heated between 35-45 degrees all year round. One can also opt for sand bathing or sample various traditional medicinal herbs. Red Sea: The whole Red Sea coast including Marsa Alam and Safaga offers a practically perfect climate for healing in rich mineral waters, with up to 35% more salt than the average sea. Oyoun Mossa and Hammam Pharaon: As well as having the most sulphuric waters in the world, both Oyoun Mossa and Hammam Pharaon boast a warm, dry climate that’s perfect for recuperating. Their success rate for curing all kinds of aches and pains is astonishingly high. All the deluxe hotel resorts also have wellness and spa centers. 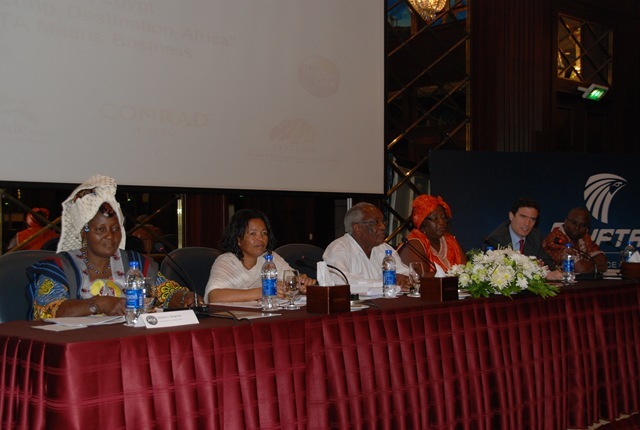 The four-day Africa Travel Association Congress, “Connecting Destination Africa,” will take place at the Cairo International Conference Center. The congress will engage participants in discussions on a range of topics, such as intra-Africa cooperation, airline access, tourism infrastructure development, tourism industry investment, branding and marketing, and responsible tourism. A special roundtable for ministers will take place, as well as the first African marketplace for buyers and sellers. The Egyptian Ministry of Tourism and the Egyptian Tourist Authority (ETA) are subsidizing hotel accommodations at the five-star Fairmont Heliopolis Hotel, for all delegates and providing transportation, logistical support, and a full day of tours in Cairo itself. The “host day” tour will include a visit to the only remaining Natural Wonder of the World, The Pyramids in Giza, as well as a visit to the National Museum. About The Africa Travel Association (ATA): ATA, a US based non-profit , Is the world’s premier travel industry trade association promoting tourism to Africa and intra Africa travel and partnerships since 1975. ATA members include ministries of tourism and culture, national tourism boards, airlines, hoteliers, travel agents, tour operators, travel trade media, public relations firms, NGOs and SMEs. 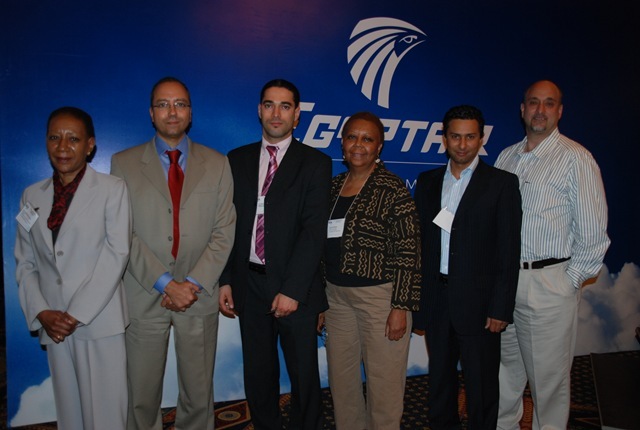 (April 3, 2009, New York, NY) Delegates to the 34th Annual Africa Travel Association (ATA) Congress in Cairo May 17-21, 2009 will have an exciting opportunity to discover Egypt’s’ rapidly developing sea coast destinations on pre or post conference trips. Alexandria, on the Mediterranean Sea and Egypt’s second largest city, is the gateway to one of the hot spots for development on the north coast. Along the Red Sea coast and on the Sinai Peninsula, the popular and well known Sharm el-Sheikh is now joined by some other tourist centers like Hurghada, Marsa Alam and the newly opened luxurious Marina complex at Port Ghalib. This coastal boom is due in large part to the increased air access with the opening of new regional international airports. Alexandria has many ancient landmarks and archaeological sites to explore including the Roman Amphitheatre, the Villa Al Toyour (Birds Villa), the first Mosaic Museum in Egypt, the Al Anfushi Tombs, El Shatby Necropolis, Pompey’s Pillar and the Catacombs of Kom El Shoqafa. The Graeco-Roman Museum has a fascinating collection which covers the period from the 34 th Century BC to the 7th Century AD. One of the foremost Alexandrian landmarks today is the Sultan Qaitbey Fort, on the original site of the “Pharos” lighthouse. Abu Sir is the name given by the Bedouins to the ancient Ptolemaic city of Tappsiris Magna. However, all that remains of the city is the 30m-high lighthouse, a quarter–sized replica of the “Ancient Wonder of the World” Lighthouse that had stood in Alexandria’s port. Three beautiful beaches are located nearby. Sharm el-Sheikh, more often referred to as “Sharm”, is an ideal resort for diving and swimming with beautiful beaches, coral reefs and the Ras Mohamad National Park. Visitors can select from a wide range of accommodations–five star luxuries to budget hotels. It is also an excellent jumping off point for tours to some of the historic places in the Sinai, including St. Catherine’s Monastery at the foot of “Jebel Musa” where Moses is said to have received the Ten Commandments. Desert Safaris feature visits to a Bedouin village and a camel ride in the desert sands. The Cairo Tower Reopens in Time for the Congress! CAIRO, EGYPT, May 13, 2009 – Cairo’s famous icon, the 60 story high Cairo Tower, has just reopened with stunning new LED nighttime light effects and panoramic view restaurants. This Cairo landmark will most certainly be an added attraction for the delegates participating in the 34th Annual Congress of The Africa Travel Association (ATA) scheduled to open Sunday, May 17 at the Conrad Nile Hotel in Cairo. The ATA Congress, hosted by the Hon.Zoheir Garranah, Egyptian Minister of Tourism and Amr El Ezaby, Chairman, Egyptian Tourist Authority (ETA), will bring together travel industry professionals from the US, Canada and Africa including tourism ministers, tourist boards, airlines, hoteliers, ground operators, as well as representatives from business, non-profit and development sectors, to address some of the challenges facing the travel, tourism, transport and hospitality industries across Africa. High profile Egyptian speakers will include, among others, the Minister of Tourism, the ETA Chairman, Hisham Zaazou, First Assistant to the Minister of Tourism, Ahmed El Nahas, Chairiman Egyptian Tourism Federation and Elhamy El Zayat, Chairman, Emeco Travel. Other featured speakers will include Hon. Shamsa S. Mwangunga, Tanzania’s Minister of Natural Resources and Tourism and ATA President, Eddie Bergman, ATA Executive Director, Dr. Elham M.A. Ibrahim, African Union Commissioner of Infrastructure and Energy, Ray Whelan, Official Representative for Accommodation, Ticketing, Hospitality and Technology for FIFA World Cups 2010 and Lisa Simon, President, US- based National Tour Association (NTA). The Egyptian Ministry of Tourism will host all ATA Congress delegates on a full-day tour to the National Museum in Cairo and to the Pyramids that will conclude with a dinner cruise on the Nile. The highest spot in Cairo, enhanced with strategically placed telescopes, The Panoramic View on the top floor offers spectacular views of the Egypt’s bustling Metropolis. The 360 Revolving Restaurant on the 59th floor, offers an array of International cuisine. The Garden Coffee shop on the 60th floor of the Cairo Tower has a more informal dining atmosphere. The new VIP Restaurant and Lounge features luxurious furnishings and an elegant upscale menu. The Tower now also has space for meetings and conferences. The visiting hours are from 9AM to Midnight. For more information on Egypt visit http://www.egypt.travel; for more information on the ATA Congress, registration and program visit http://www.africatravelassociation.org.